E-PASS is CFX’s electronic toll-collection system. With an E-PASS transponder affixed to your windshield, you can automatically pay tolls at a discount without having to stop at tollbooths. Each time you pass through a toll point, the toll is deducted from your prepaid E-PASS account. Funds are added to your E-PASS account using cash or your debit or credit card. A record of all transactions is included in the customer’s monthly statements, which are available online. How do I get an E-PASS? Monday-Friday, 8 a.m.-6 p.m. & Saturday, 9 a.m.-1 p.m.
Reload Lanes: Visit the drive-up customer service lanes located at the SR 408 Conway toll plaza, SR 417 John Young Parkway toll plaza and SR 429 Forest Lake Main toll plaza. Reload Lanes are open seven days a week from 6 a.m.-8 p.m.
What are the benefits of becoming an E-PASS customer? • Customer Loyalty and Beltway Discount programs offer additional savings based on frequency of travel on CFX expressways. *Contingent on actual revenues trending 2%+ above March 2015 projections for the 6-year I-4 Ultimate construction period. **Beltway discount only applied to CFX portions of SR 417, SR 429 and SR 414. The E-PASS Sticker, Portable or CollegePass can be used on all toll roads and most toll bridges in Florida, Georgia and North Carolina. Just look for the E-PASS, SunPass or LeeWay logo as you enter a toll road in Florida. Also, with E-PASS Xtra – CFX’s new electronic toll pass – you’ll be able to enjoy the convenience of non-stop travel in 18 states from Florida to Maine and west to Illinois. E-PASS Xtra is fully compatible with E-PASS, SunPass, LeeWay, PeachPass, NC QuickPass, E-ZPass, RiverLink, I-PASS and FastPass toll systems. Click here to learn more about E-PASS Xtra. How do I install an E-PASS transponder in my vehicle? Whether you have an E-PASS Sticker or Portable device, place it on the windshield’s interior directly behind the rearview mirror. Improper installation may result in the transponder’s signal failing to register at toll collection facilities. If that happens, you will be sent a Pay By Plate invoice for unpaid cash tolls, plus a 20-cent processing fee per toll. Placing your E-PASS elsewhere in your vehicle is a violation of the user agreement. E-PASS may not be compatible with vehicles with certain metal oxide or glass features that interfere with the transponder being read properly, requiring a bumper mount transponder. If you experience difficulty, contact your car dealer to confirm compatibility. Can I move my E-PASS Portable or E-PASS Xtra from car to car? Yes, but only to a vehicle of the same class (e.g., two axles). Be sure to update your E-PASS account with the change in vehicle information before driving the different vehicle than what’s registered to the transponder on your account. To do that, log in to your E-PASS account, call E-PASS Customer Service at 407-823-7277 or 1-800-353-7277 (Monday-Friday, 8 a.m. – 6 p.m.), or visit the E-PASS Service Center at 762 S. Goldenrod Road, Orlando, FL 32822 (Monday-Friday, 8 a.m. – 6 p.m. & Saturday, 9 a.m.-1 p.m.). E-PASS Stickers CANNOT be moved from vehicle to vehicle. Can I use E-PASS on my motorcycle? Only E-PASS Portable and E-PASS Xtra can be used on a motorcycle. It will work in a saddlebag or storage compartment. E-PASS Stickers cannot be used with motorcycles. Are there any lane or speed restrictions when using E-PASS? • E-PASS Express Lanes — Express lanes are identified by overhead gantries extending across expressways. Drivers with E-PASS and other accepted transponders can travel on these lanes at the posted highway speed. • E-PASS Dedicated Lanes — Dedicated lanes resemble traditional tollbooth lanes, however, they are unattended and equipped with electronic toll-collection devices that pick up transponder signals. The speed limit through these lanes is 35 miles per hour. • Exact Change & Cash Lanes — These are traditional tollbooth lanes for cash-paying motorists. Drivers with E-PASS and other accepted transponders may use these lanes but should expect stop-and-go traffic. The speed limit in these lanes is 25 miles per hour. Does E-PASS offer toll discounts? Yes. On average, E-PASS customers save 23% on tolls compared with cash-paying customers. Additionally, CFX offers Customer Loyalty and Beltway Discounts based on frequency of travel. Does CFX provide free passage to persons with disabilities? According to state statute, any handicapped person who has a valid driver’s license, who operates a vehicle specially equipped for use by the handicapped, and who is certified by a physician as being severely physically disabled and having permanent upper limb mobility or dexterity impairments shall be allowed free passage on all expressway systems. To obtain a non-revenue transponder, please call E-PASS Customer Service at 407-823-7277 or 1-800-353-7277, Monday-Friday, 8 a.m.-6 p.m. This program is administered by the Florida Commission for the Transportation Disadvantaged. For more information, click here. You can set up an online account using a smartphone, tablet or desktop computer. You’ll need your account number and PIN. Click here to see more features of your online E-PASS account or take a virtual tour. How do I manage or update information on my E-PASS account? Online: Manage an E-PASS account from your smartphone, tablet or desktop computer. Check your account balance, add funds, view toll transactions and run activity reports in a single click. Plus, you can update your vehicle information, add multiple vehicles or add a new transponder. Click here to see more features of your online E-PASS account or take a virtual tour. Reload Lane: Add funds using cash, credit or debit by driving through a Reload Lane at the SR 408 Conway toll plaza, SR 417 John Young Parkway toll plaza and SR 429 Forest Lake Main toll plaza. What do I need to do if I change vehicles and want to move my E-PASS? To update your account with the latest vehicle information, log in to your E-PASS account, call CFX Customer Service at 407-823-7277 or 1-800-353-7277 (Monday-Friday, 8 a.m.-6 p.m.) or visit the E-PASS Service Center at 762 S. Goldenrod Road, Orlando, FL 32822 (Monday-Friday, 8 a.m.-6 p.m. & Saturday, 9 a.m.-1 p.m.). If you have an E-PASS Sticker, CFX will replace it for free. E-PASS Stickers will not work after being removed from a windshield. Please note: CollegePass Stickers must be re-purchased for a new vehicle. If you have an E-PASS Portable or E-PASS Xtra, move it to the new vehicle once the vehicle information has been updated. How do I add funds to my E-PASS account? Can I use cash? Online: Log in to your online account and click Reload E-PASS using a credit/debit card or checking account number. Phone: Call E-PASS Customer Service at 407-823-7277 or 1-800-353-7277 (Monday-Friday, 8 a.m.-6 p.m.) and adds funds with a credit/debit card or checking account number. Mail: Send a check or money order to “Central Florida Expressway Authority, PO Box 585070, Orlando, FL 32858.” Please include on the check your E-PASS account number, license plate number and state that issued your license plate. In Person: Visit the E-PASS Service Center at 762 S. Goldenrod Road, Orlando, FL 32822 (Monday-Friday, 8 a.m.-6 p.m. & Saturday, 9 a.m.-1 p.m.) and add funds using cash, check or credit/debit card. There is a drop box for after-hours payments. Checks deposited in the drop box will be credited to accounts the next business day. Touch-n-Buy kiosk: Visit a Touch-n-Buy kiosk to add funds or pay a Pay By Plate invoice with cash (plus $1.50 service fee). You’ll need the transponder number on your E-PASS Sticker or Portable, or your invoice number. Auto-Replenish: Set up auto-replenishment on your online account with a debit or credit card. If your prepaid account lacks funds to cover toll charges, you will be issued a Pay By Plate invoice. Pay By Plate charges the cash toll rate, plus a 20-cent processing fee per toll. Does E-PASS charge a monthly account fee? No, E-PASS does not charge an account fee. Where can I find the E-PASS User Agreement? What are the differences between E-PASS & SunPass? E-PASS is owned and operated by the Central Florida Expressway Authority (CFX) and SunPass is owned and operated by Florida Department of Transportation (FDOT) / Florida Turnpike Enterprise (FTE). How are the E-PASS and SunPass toll paying systems linked? E-PASS and SunPass are prepaid toll collection systems that allow you to automatically pay tolls as you drive on any toll road in Florida, Georgia and North Carolina. This is because Florida toll agencies operate under an interoperability agreement. This agreement is to collect tolls on behalf of the owner of the road. For example, if an E-PASS customer travels on a FDOT/FTE owned toll road, when the customer goes through a tolling point, the tolling system forwards the transaction information to CFX. CFX charges the customer’s E-PASS account and forwards the toll amount to FDOT/FTE. The same process happens to SunPass customers that choose CFX owned toll roads. 1. E-PASS and SunPass electronically transfer toll transactions daily for processing. 2. E-PASS customer toll transactions are posted to your E-PASS account and appear on your E-PASS billing statement. 3. E-PASS customers receive only one monthly statement, an aggregation of all toll transactions incurred on any toll road where E-PASS is accepted. 4. E-PASS customers are responsible for ensuring there are sufficient funds on their prepaid account to cover the cost of tolls, regardless of which tolling agency operates the toll road. Where does my E-PASS work? E-PASS works on all toll roads in Florida and is accepted everywhere SunPass and LeeWay are accepted. This includes toll roads operated by the Central Florida Expressway Authority (CFX), Tampa-Hillsborough Expressway Authority (THEA), Miami-Dade Expressway Authority (MDX), Florida Turnpike Enterprise (FTE) and the Cape Coral, Midpoint Memorial, and Sanibel Causeway bridges in Lee County. E-PASS is also accepted in Georgia and North Carolina everywhere PeachPass and NC Quick Pass are accepted. E-PASS Xtra is accepted everywhere E-PASS and E-ZPass are accepted including 18 states from Florida to Maine and west to Illinois. The SunPass toll system shut down for migration on June 1. Resultant delays created a backlog of unprocessed tolls for some drivers. How did that impact E-PASS customers? If you are an E-PASS customer who did not travel on FDOT / FTE (SunPass)-owned roads, your account was not impacted. If you are an E-PASS customer and did travel FDOT/FTE (SunPass) roads during the migration, the majority of toll transactions incurred on FDOT / FTE (SunPass) roads did not post to E-PASS customer accounts between June 1st, 2018 and August 31, 2018. This means your June, July, and August statements showed charges lower than usual. CFX isolated the backlogged tolls from the current toll transactions at the time. E-PASS’s customer payment program allowed E-PASS customers to manage their payment of the isolated backlogged tolls and minimized any unexpected financial impact. Your E-PASS account was not automatically debited for those tolls. Was I charged for all tolls that I incurred while traveling on SunPass owned roads since June 1, 2018? What are my payment options? Yes, you were charged for toll transactions during the SunPass system migration if you drove on a FDOT/FTE (SunPass)-owned road between May and September 2018. E-PASS received the toll transaction data from SunPass for E-PASS customers. The CFX team remains committed to minimizing any unexpected impacts or financial burden to E-PASS customer accounts. The isolated backlogged SunPass toll transactions were available to review and pay on your online E-PASS customer account profile. Notification was sent to you via email and/or mail that the isolated backlogged SunPass toll transactions were now available to view. Customers could login to their E-PASS account to review all isolated backlogged SunPass toll transactions for accuracy. Reports were available in several formats should reimbursement from an employer had been needed. IMPORTANT NOTICE: FDOT notified CFX that the transaction date/time stamps appearing on isolated backlogged tolls may be incorrect. If you have an invalid toll transaction on your account, please dispute the transaction by selecting the box marked dispute next to the erroneous transaction online or contact a customer service representative at 1-800-353-7277. No further action will be required from you. Should a question arise, you will be contacted directly by CFX. Customers had until December 31, 2018 to pay the full balance of the isolated backlogged tolls. You may pay the balance in full if you prefer. No fees were charged for these tolls. The isolated SunPass tolls appeared on your E-PASS statement as they were paid. Is the SunPass system back online and working properly? Yes. It is always a good idea to monitor your E-PASS account balance and transaction activity by logging in to your account. How did these delayed toll charges appear on my E-PASS statement? How was I notified? The isolated SunPass backlogged tolls appeared on your E-PASS statement as the tolls were paid. Charges from tolls on FDOT/FTE (SunPass)-owned roads appeared on your E-PASS statement as a blank space under Toll Type denoting other agency. Charges from tolls on CFX roads appeared with an “E” under Toll Type denoting electronic. IMPORTANT NOTICE: FDOT notified CFX that the transaction date/time stamps appearing on isolated backlogged tolls may be incorrect. If you have an invalid toll transaction on your account, please dispute the transaction by selecting the box marked dispute next to the erroneous transaction online or contact a customer service representative at 1-800-353-7277. No further action will be required from you. Should a question arise, you will be contacted directly by CFX. Did I receive my Beachline rebates? Yes. Beachline past and current rebates were applied. Please call, email or visit our walk-in center for further assistance. Was I subjected to any additional fees as a result of the SunPass system migration? I have additional questions. How do I contact customer support? E-PASS customers with unpaid toll transactions stemming from the SunPass system migration can now access the E-PASS Customer Payment Program by logging on to your E-PASS Account. This program puts impacted E-PASS customers back in the driver’s seat by isolating backlogged tolls and providing you with the choice to pay the tolls over a three-month period or in full if you prefer. These transactions originated on Florida Department of Transportation/FTE toll roads. Please be aware that you may see transactions between the months of May through September in the report. This is because the Florida Department of Transportation has not been able to separate backlogged tolls consistently from current tolls. Please visit our website at CFXWay.com to review Frequently Asked Questions about the “SunPass Migration Impact to E-PASS Customers” including the “E-PASS Customer Statement sent on August 23, 2018” to learn about the impact of the SunPass system migration to some E-PASS customers. As always, our local customer support team is available to answer any questions you might have. Thank you for choosing E-PASS! On September 12th CFX launched the E-PASS Customer Payment Program with unpaid toll transactions originating on Florida Department of Transportation/FTE toll roads that stemmed from the SunPass system migration. This program puts you back in the driver’s seat by isolating backlogged tolls and providing you with the choice to pay the tolls over a three-month period, pay in full or dispute transactions. Several days after the Customer Payment Program was made available on your account, we were notified by FDOT that millions of the transactions had errors with the time and date stamp being off by as much as 9.5 hours. Prior to disputing or paying, E-PASS customers are encouraged to review all of the backlogged transactions associated with your account. Should you have questions a customer service representative is available to assist you at (407) 823-7277 or 1-800-353-7277, 8:00AM – 6:00PM (Monday through Friday) or email us at e-pass@cfxway.com. Two toll agencies own and operate pre-paid toll accounts in Central Florida. The Florida Department of Transportation/Florida’s Turnpike Enterprise (FDOT) and the Central Florida Expressway Authority (CFX). 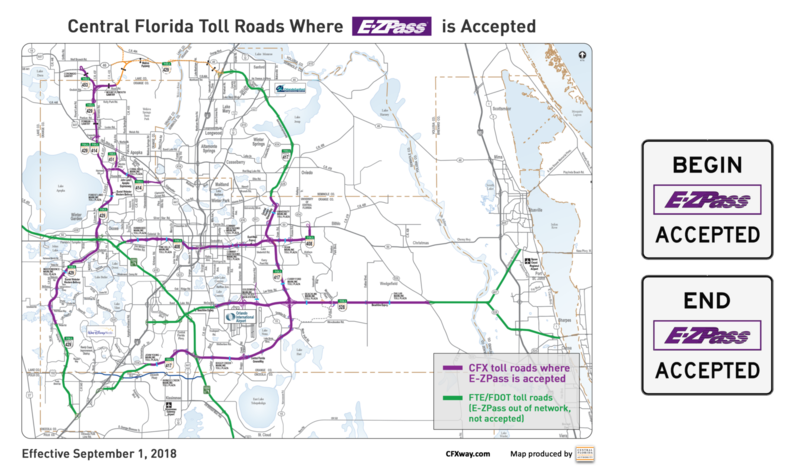 (MAP) The Florida Department of Transportation manages SunPass accounts and CFX manages E-PASS accounts. On August 14, 2018, the Florida Department of Transportation (FDOT) announced that all backlogged toll transactions resulting from the SunPass system migration have been processed and that the backlog of toll transactions has been cleared on SunPass customer accounts. What does this mean for E-PASS customers? E-PASS customers who have only driven on CFX roads since June 1 are NOT impacted. • You will be notified that these transactions are ready for review. • Transactions will be provided to you in transaction date order. • After reviewing the transactions for accuracy, you will be given the opportunity to pay the tolls over a at least a 3-month period. You will also be able to pay the balance in full if you prefer. If you find inaccuracies you will be able to dispute the transaction. • You will choose your payment method and payment date(s). Your E-PASS account will not be automatically debited for the isolated backlogged SunPass tolls. • You will have the option to print a report. • Current toll activity on your E-PASS account will not be affected. • Contact CFX at e-pass@cfxway.com anytime or 1-800-353-7277 from 8 a.m.-6 p.m., Monday through Friday if you need assistance. CFX is committed to minimizing the impact of the SunPass system migration on E-PASS customers. For more detail on the payment process outlined above, please read our Frequently Asked Questions (FAQs). How do I pay tolls on the expressways? What happens if I travel through an all-electronic tolling point (such as on the Wekiva Parkway) without a toll pass? If you miss paying a toll, a Pay By Plate invoice is issued to the vehicle’s registered owner. Do I still have to pay tolls if I get on a toll road by mistake? Yes. Failure to pay tolls with cash or a via transponder will generate a Pay By Plate invoice that’s mailed to the vehicle’s registered owner. Am I responsible for paying missed tolls when someone else drove my car? Yes. A Pay By Plate invoice is issued to the vehicle’s registered owner for tolls not paid with cash or via a transponder. Failure to pay toll invoices could result in CFX placing a hold on your vehicle tag registration or driver’s license renewal. How do I pay my tolls before receiving a Pay By Plate invoice? Call a CFX Customer Service Representative at 407-690-5200, Monday-Friday, 8 a.m. to 6 p.m., for assistance. Please have the vehicle license plate number and dates you may have missed the toll. What is all-electronic tolling? How does it work? All-electronic tolling (AET) eliminates cash tolls and is in use on the Wekiva Parkway. With AET, expressway customers pay tolls automatically via E-PASS or another accepted transponder, or through Pay By Plate, which scans license plates of vehicles as they pass through toll points. PayTollo® is a mobile phone app that drivers can use to pay tolls. It works on either iOS or Android smartphones. Click here for more information about how PayTollo® works. Paytollo® is currently not accepted in rental cars in Florida. How much do I pay under current toll rates? E-PASS customers pay an average of 14 cents per mile while cash customers pay an average of 16 cents per mile. View the Toll Rate Chart here. To calculate tolls for a specific trip, use the Toll Calculator. Click here for information on Poinciana Parkway toll rates. Can I estimate the tolls for my trip? Yes, just use the Toll Calculator. Will there be future toll increases? Yes, there are planned toll increases. The CFX Governing Board authorizes toll increases. Click here to read our Toll Policy. Why Do I Pay Tolls? Why are tolls charged for driving on Central Florida expressways? Tolls are the only source of revenue used by CFX to operate and maintain its expressways as well as pay back bondholders who loaned private capital to finance, construct, and maintain the 118-mile expressway system. Why do I need to pay a toll when I already pay taxes? There are two types of roads – toll roads and tax supported roads. The big difference is that you only pay for a toll road when you choose to drive on it. With tax supported roads, the taxes you pay for fuel, tires and other equipment go to support roads throughout the state that you may never use. Are tax dollars used for the operation of the CFX expressways? No. CFX does not receive state or federal tax dollars to operate and maintain the 118-mile system. Instead, tolls are collected from our customers, which allows traditional funding to better serve this region and the state’s non-tolled transportation system. This is a myth. A toll is a user fee, not a tax. If you don’t use the toll road, you don’t pay for it. You only pay a toll when you choose to drive on a toll road for a higher level of convenience, reliability or safety. Toll customers, through the fuel they consume, also pay their share of local, state and federal taxes to fund non-toll roads that are open to all. Where do my tolls go? Tolls collected on CFX expressways are reinvested locally, funding the maintenance, operations, and construction of our expressway system. Learn about where your toll dollars go. Why are we still paying tolls on CFX roads built some 40 years ago? Tolls pay for the maintenance and operations of the expressways beyond the initial cost of construction. This includes work such as resurfacing, widening, mowing, safety, etc. Once the construction of a toll road is paid for, will tolls go away? No. In addition to the initial construction, tolls also support the ongoing maintenance and operation of new and existing expressways. With Central Florida’s continued growth the transportation needs outpace the resources available through state and federal gas taxes. What are Reload Lanes and where are they located? Reload Lanes are drive-up customer service booths where motorists can open E-PASS accounts or reload their prepaid toll accounts using cash, check or credit/debit cards. Reload Lanes are located on east- and west-bound lanes at the State Road 408 Conway toll plaza, as well as on north- and south-bound lanes at the State Road 417 John Young Parkway toll plaza and the State Road 429 Forest Lake Main toll plaza. They’re open seven days a week from 6 a.m. to 8 p.m.
What method of payment do the Reload Lanes accept? Reload Lanes accept cash, check or credit/debit card. I just got my free E-PASS Sticker through a Reload Lane. What else do I need to do? If you’ve been through a Reload Lane, visit ReloadEPASS.com and log in with the account number and PIN on the receipt the attendant gave you. Enter the requested information to complete enrollment and activate your account. When are the Reload Lanes open? Reload Lanes are open seven days a week from 6 a.m. to 8 p.m.
How do I pay tolls if I’m driving a rental car? You can pay with cash or with an accepted transponder. Ask the rental car company if it offers E-PASS and what fees you’d incurred for using its toll program. If you own an E-PASS Portable, you could move it to the rental car provided that you inform the rental car agency that you’re using it in its vehicle. The rental vehicle and the vehicle from which you’re transferring the E-PASS must be the same class (e.g., two axles) .You also must update your account information with the rental vehicle’s license plate number. If you fail to pay tolls, CFX will issue a Pay By Plate invoice to the registered vehicle’s owner, the rental car company, which likely will charge you for unpaid tolls, plus service fees. CFX also charges a 20-cent processing fee per toll transaction. I was vacationing in Orlando and while driving a rental car I missed paying some tolls. Can I pay now? No, because we may have already issued an invoice to the car rental company and it may have processed payment for your unpaid tolls. The car rental company may charge you for tolls and service fees. No. PayTollo® is currently not accepted in rental cars in Florida. Do I have to use the rental car company’s toll program? How does it work? No. You can pay tolls with cash on all CFX expressways except the Wekiva Parkway, which uses all-electronic tolling. But if you miss paying tolls, a camera records the vehicle’s license plate and CFX issues an invoice to the rental car company. The rental company may pay the invoice and charge you to recover the cost of the tolls, plus service fees. Check your rental agreement for fees on unpaid tolls. Can I use my E-PASS in a rental vehicle? Yes, if it’s an E-PASS Portable and you’re transferring it to a vehicle of the same class (e.g., two axles). But be sure to update your E-PASS account with the change in vehicle information before driving the rental car on CFX roads. Log in to your E-PASS account, call E-PASS Customer Service at 407-823-7277 or 1-800-353-7277, Monday-Friday, 8 am.-6 p.m., or visit the E-PASS Service Center at 762 S. Goldenrod Road, Orlando, FL 32822 (Monday-Friday, 8 a.m.-6 p.m. & Saturday, 9 a.m.-1 p.m.) to update your account with the rental vehicle’s information. E-PASS Stickers CANNOT be moved from vehicle to vehicle. Can I use an out-of-state toll transponder in a rental vehicle? Yes, if it’s E-ZPass, NC Quick Pass or Georgia’s Peach Pass. But be sure to update your account with the change in vehicle information before driving on CFX roads. Will my E-ZPass work in Florida? When using your E-ZPass, you will be charged the electronic toll rate on CFX-owned expressways. I have Florida toll pass (E-PASS, SunPass, or Leeway) and an E-Zpass. Will I be double-charged or charged by both accounts on CFX toll roads? If you travel on CFX roads with a Florida-based toll pass (E-PASS, SunPass, or Leeway) and E-ZPass, you could be charged by both accounts. For those customers with multiple transponders, it is recommended that you remove the E-ZPass transponder from your vehicle or place it into a Radio Frequency (RF) shield bag while driving throughout Florida in order to avoid the possibility of being charged by both transponders. You can also purchase an E-PASS Xtra which allows you to travel among 18 states including throughout Florida with one toll transponder and one toll account. Click here for more information. If you notice charges for the same date and time on two different prepaid toll accounts for driving on CFX roadways, please email your toll transaction statements from both agencies to e-pass@cfxway.com and we will review and assist you with the dispute. If you have any questions or concerns, you can call (800) 353-7277. E-PASS Customer Service hours are 8 a.m.-6 p.m. (Monday – Friday). As a reminder, it’s important that all prepaid toll accounts are current and up-to-date. Is there a transponder that works everywhere E-PASS and E-Zpass is accepted? Yes! Now you can purchase the new E-PASS Xtra transponder, which works on all toll roads in Florida and Georgia and wherever E-ZPass is accepted – 18 states total. With E-PASS Xtra, you can travel seamlessly in 18 states while managing one toll account. Pay By Plate provides drivers an option to pay tolls by invoice using video images of vehicle license plates captured at toll points. It’s an easy way to pay tolls if you don’t want to pay cash and don’t have an E-PASS account, or compatible toll payment accounts i.e. SunPass, LeeWay, Quick Pass, Peach Pass, or E-ZPass, etc. As you travel under a toll point on CFX expressways, the vehicle license plate is captured. If the license plate is not listed on a valid toll payment account i.e. E-PASS, SunPass, E-ZPass, etc., the vehicle’s registered owner will be mailed a Pay By Plate invoice for all tolls. Pay By Plate is the cash toll rate plus $.20 per toll, considerably higher than the E-PASS electronic toll rates. Can I receive one consolidated Pay By Plate invoice for travel on different toll systems? No. Each tolling authority will issue separate invoices. How do I pay a Pay By Plate toll invoice? Invoices can be paid online, by phone, through the mail, or in person at the E-PASS Service Center and at any of our cash payment retail locations throughout Florida. Authorized Retailers: Search from a list of authorized merchants at locations near you simply by clicking here. Please note, these authorized merchants will collect a separate convenience fee of $1.50. Pay By Plate is the E-PASS cash toll rate plus $.20 for each unpaid toll. • First name appearing on vehicle registration receives a Pay By Plate invoice by mail. • Vehicle owner must pay within 30 days from invoice date. • Day 31, a past due invoice notice is issued, requesting payment within 15 days of invoice date. • If a Pay By Plate invoice goes unpaid, the total amount due may be referred to the Florida Department of Highway Safety and Motor Vehicles (DHSMV) to place a registration hold on the vehicle license plate or revalidation sticker. The hold stays in place until invoice is paid in full. Call a CFX Customer Service Representative at 407-690-5200 Monday-Friday, 8 a.m.-6 p.m. and they can assist you. Please have the vehicle license plate number and dates you may have missed the toll. How would I dispute an invoice or toll charge? Call a CFX Customer Service Representative at 407-690-5200 Monday-Friday, 8 a.m.-6 p.m. and they can assist you. …why did I receive a Pay By Plate invoice? To resolve this matter, you can login into your account at e-pass.cfxway.com or call a CFX Customer Service Representative at 407-690-5200 M-F, 8 a.m. to 6 p.m. Please have available your transponder number, the Pay By Plate invoice you received, and vehicle license plate number to update your account information. …why did I receive a Toll By Plate invoice from SunPass? To resolve this matter, call SunPass to pay this invoice at 888-865-5352. To avoid any future Toll By Plate invoices, login to your account at e-pass.cfxway.com and ensure your account is up to date and has adequate funds. To resolve this matter, please call a CFX Customer Service Representative at 407-690-5200 M-F, 8 a.m. to 6 p.m. or pay your invoice online. Contact SunPass regarding the status of your SunPass account (i.e., expired credit card, delinquent balance) or to update your account information. Why did I receive an invoice for a vehicle I no longer own? If you no longer own the vehicle or license plate, you will need to contact the appropriate department of motor vehicles to correct their registration information. Please call a CFX Customer Service Representative at 407-690-5200 M-F, 8 a.m. to 6 p.m. and they can assist you. What do I do if a hold is placed on my vehicle registration? If you have outstanding unpaid tolls and fail to pay a Pay By Plate invoice, you will not be able to renew your vehicle registration. All outstanding Pay By Play invoices including active violations must be paid in full to have the hold(s) removed. Partial payments are not accepted. Click “Pay Your Invoice” to pay the unpaid toll(s) online with a credit card or call the Toll Enforcement Office at 407-690-5200. What is a Uniform Traffic Citation (UTC)? Uniform Traffic Citation (UTC) is the technical term for a ‘traffic ticket.’ It serves as a notice for violating Florida’s Motor Vehicle law* for ongoing failure to pay tolls on a toll facility. In such event, a UTC is issued and mailed to registered owner of the motor vehicle who is responsible and liable for payment. The registered owner has 30 days from the date of issuance of the citation to resolve the UTC through the Central Florida Expressway Authority (CFX). *Florida State Law (Statute 316.1001) requires payment of prescribed tolls for the usage of toll facilities. Failure to comply with this statute may result in the assessment of court costs, and suspension of your vehicle registration and/or driver’s license. How should I resolve a Uniform Traffic Citation (UTC)? To resolve a UTC issued on behalf of the Central Florida Expressway Authority, you must contact a CFX Customer Service Center representative between 8AM and 6PM Monday – Friday at 1-800-353-7277 or 1-407-823-7277 within 30 days from the date of issuance. When you call, please have the following information available: UTC reference number and vehicle tag number. Failure to pay after 30 days means the UTC is now filed with the Clerk of Court’s Office in the county where the vehicle is registered. At this point, CFX no longer has the authority to help resolve the issued UTC. Hereafter, the UTC must be resolved through the Clerk’s Office. How can I pay the Uniform Traffic Citation (UTC)? A UTC can be paid online, by phone, through the mail, or in person at the E-PASS Service Center and at any of our cash payment retail locations throughout Florida. You will need the vehicle tag number (license plate), UTC reference number and name of the registered owner of the vehicle. We accept credit and debit cards, checks, money orders and cash. Where can I see past and future public meetings, agendas and minutes? Past and future public meetings are listed on the Meetings Calendar. Click on a meeting to see resources, such as meeting agendas and minutes. Who can attend CFX Governing Board meetings? CFX Board meetings are open to the public and anyone can attend. Where are CFX Governing Board meetings held? Unless another location is announced, CFX Board Meetings are held in the boardroom of Central Florida Expressway Authority headquarters at 4974 ORL Tower Road, Orlando, FL 32807. Are Board meetings broadcast live on television? Yes, on Orange TV (Channel 488 on Spectrum, Channel 9 on Comcast, 1081 CenturyLink Prism TV, 10.2 Digital Over the Air ). How can I watch past Governing Board meetings? View past meetings in the video archive. How do I make a public comment at a Governing Board meeting? Please fill out and submit a public comment form. Hours: Mon-Fri 8 a.m.-6 p.m. Available Mon-Fri 8 a.m.-6 p.m.